British director Andrea Arnold takes a glimpse into the spontaneity and rawness of life with her new coming-of-age film AMERICAN HONEY. AMERICAN HONEY tells the story of troubled teenager Star (Sasha Lane) who runs away from a broken home to joins a traveling magazine sales crew. Caught up in a whirlwind of hard partying, law breaking and young love, Star forms a forbidden romance with team leader Jake (Shia LaBoeuf) and embarks on her new journey. Raw, edgy but ultimately forgetful, AMERICAN HONEY is a coming-of-age film about the highs and low of youth and freedom. The story gets off to a strong start with a young Star taking control of her life by leaving behind her dumpster-diving siblings and abusive stepfather to join the group of unlikely misfits. But as the story continues to develops, the narrative begins to lose momentum and the plot veers off in a meaningless direction. The biggest problem with AMERICAN HONEY is that the story never really goes anywhere. It is easy to understand why Star wants to embark on this journey but what is frustrating is that she never seems to learn from her actions. Even the romance between her and Jake doesn’t really seem to mean anything so any emotional investment in the couple feels wasted. At an epic 162 minutes, the film is also way too long. Pretty soon, the mundane shots of the group singing, smoking and drinking in the van begin to become tedious and any interest we had in the characters at the start, slowly starts to diminish as the plot lingers on. What is worth the time however is the stellar lead performance by Sasha Lane. Arnold has a considerable eye for fresh female talent and Lane delivers a simply astonishing debut performance as the mouthy, street-smart and naïve Star. The film is also visually stunning with Arnold’s decision to use extreme close-ups, handheld cameras and 4:3 aspect ratio giving the film a unique and personal feel. 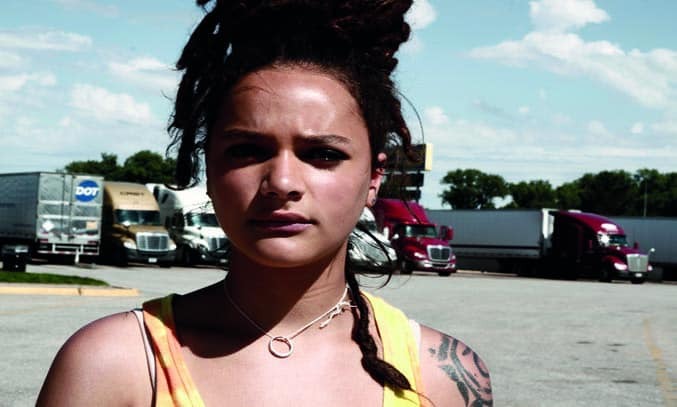 For all its faults, there some moments of greatness in AMERICAN HONEY and Sasha Lane’s performance is simply stunning. Shame then that the loose storyline, bloated runtime and jarring soundtrack overpowers this otherwise bold and beautiful piece.